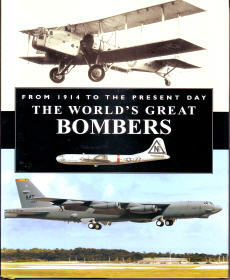 Featuring more than 60 full-color artworks and 80 photographs, The World’s Great Bombers includes the following aircraft: World War I: Avro 504, Voisin Type L, Breguet Type V, Gotha G 4, Handley Page O/400, Macchi M.8, Zeppelin-Staaken R 6. The inter-war period: Airco D.H. 10, Vickers Vimy, Tupolev ANT-4, Junkers K 43, Aero A. 100, Mitsubishi Ki-2-1, Martin B-10. World War II: Heinkel He 111, Tupolev SB-2, Boeing B-17, Junkers Ju 88, Liore-et-Olivier leO 451, Amiot 351, Dornier 217, Short Stirling, Consolidated B-24, deHavilland Mosquito, Avro Lancaster, Heinkel He 177, Nakajima Ki-49, Boeing B-29. Post-war period: Avro Lincoln, Boeing B-50, North American B-45, Convair B-36, IIyushin II-28, Martin B-57, Tupolev Tu-16, Boeing B-52, Tupolev Tu-95, Mirage 4, Tupolev Tu-22m, Rockwell B-1, Northrop B-2. 176 pgs w/index, HB w/dust jacket, 7.25 x 9.75, b&w and color photographs.